A motorcycle is simply a machine. It is given life and abilities designed to meet the needs of the masses. When you demand more from your machine, you need a master mechanic to give that machine an identity. Your machine needs a personality that matches your style. The bond between man and machine needs to be forged by hands that know how to make your bike an extension of you. Gregg Lynk is someone who understands this. 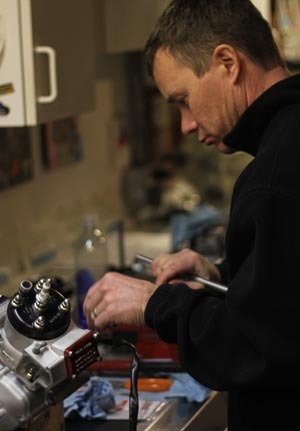 He has built a reputation within the highly competitive world of Motocross, Supercross, Arenacross, and as a trusted technician with the most advanced motocross bikes on the planet. Losing is not in the playbook of professional athletes and mechanical failures are not an option. Gregg Lynk is capable of making your bike just as potent and reliable as other bikes that also reach the top of the sport. Gregg Lynk is not new to the sport of motocross. Like most of us he found his passion for the sport at a young age when he stepped over the saddle of a motorcycle for the first time. As the story goes with many of us, riding becomes racing and racing becomes a way of life. Gregg lived each day in search of the next race, the next hole shot, and the next win. Gregg raced his way through his teens until age 20 when other desires began to take over. Maintenance is a necessity that all racers must accept but for Gregg, tuning motocross bikes became an obsession. Gregg Lynk’s mechanical pedigree is extensive to say the least. Over the past few decades, Gregg has helped nurture many racers to championships. It all started in 1993 when Gregg was hired to help Greg Rand and his campaign at Loretta Lynn’s. That year Rand walked away with three National Titles in the 125A, 250A and International Class on a Suzuki. In 1995, Gregg moved back home to Vermont to work with local pro Chad Shepard. Chad and Gregg worked hard for the results they earned, and to this day, Gregg credits that year for helping him to develop his work ethic. That work ethic paid off in 1997 when Billy Whitley of Factory Suzuki backed the “Primal Impulse” team, and called Gregg to work as the Race Shop Manager and Suspension Technician in California. Gregg learned from suspension master Rob Henrickson of RG3 Suspension. He also had the pleasure of learning engine tuning from Jeff Springman of Bill’s Pipes and applies these skills to every bike he touches. In 2000, Gregg guided Brandon Jesseman and his Suzuki RM 125 to 6th place in the East Coast 125 Supercross Series and to 11th in the AMA 125 Motocross Nationals. 2001 was a milestone year for Gregg as he went to work for the “Budman”. Buddy Antunez gave Gregg his first taste of the high energy Arenacross Series with 28 main event wins and the National Championship. Together Buddy and Gregg earned 100 Arenacross wins, which is still a record to this day. When Buddy went to compete in Supercross in 2002, Gregg stayed with Suzuki and racer Rusty Holland. Rusty finished the Arenacross Series in 5th. This was to be the last year that Gregg worked with Billy Whitley, but over the 5 years preceding, Gregg obtained the knowledge necessary to run a successful and professional program. That knowledge carried over to Gregg’s work as both a mechanic and team manager for BBS Racing and 2004′s FBC Honda Team. He worked as management with one of the most successful Arenacross teams in history as well as with Eli Tomac. Gregg went back with American Suzuki for the 05′-06′ Boo Koo Arenacross Series as the team manager for the Suzuki, Fun Center, TLD, PPG Race Team. What Gregg possesses is an impressive resume earned from working with some of the top racers and teams in the country. He has combined his knowledge of the motorcycle with his business degree, professional attitude, and a passion for the industry. He is a grounded family man who takes pride in the work he performs. It does not matter if you are already a champion, or an up and coming amateur with desire. Gregg is…..